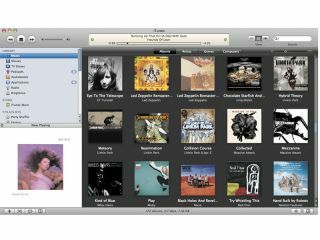 Will we see iTunes given a radical overhaul tomorrow? If Apple announces a tablet at its event tonight, it really will be a classic "one more thing" surprise. But it doesn't seem like that will be the way the evening goes. Instead, we'll get some new and improved iPods, while rumours continue to circulate that the iPod classic will be killed off. Apple sent media invites to the "it's only rock and roll" event last week and TechRadar will be attending together with our friends from MacFormat. It all kicks off at 1800BST (1700GMT) and we'll bring you images and hands-on reviews of the new kit just as soon as we can. We'll be posting live from the event, too, so check back here. The September Apple event has always been a iPod launch, and we're expecting an improved nano and iPod touch. It seems certain the iPod touch will have a camera and a flash, meaning that it can't be long til we get a flash camera on the iPhone, either. The nano is also expected to get some kind of camera, and lots of cases have already been spotted that purport to cater for both devices. Of course, they'll also go up in terms of capacity – expect a 64GB iPod touch this time – but flash memory is still expensive, so don't expect anything too radical in this area. If the iPod classic goes end-of-life, it'll be the end of an era, but will be a signal that people would now rather buy the cooler iPod touch and sync their tunes more often. Or, of course, they have an iPhone. Steve Jobs is expected to make at least some kind of appearance, his first since returning to Apple after his leave of absence. He may well even do the whole thing, but we'd expect him to take the opportunity of stepping back a little from the limelight proper, so expect at least one other face to be a part of the proceedings. Any appearance from Jobs will provide something of a lift for Apple and for its shares, which took a series of nosedives when Jobs was unwell. We'll also inevitably see a new version of iTunes. Surely Apple has a full bloatware-busting revamp in the works, but we expect version to have interaction with social sites such as Facebook and Last.fm, with artist bio information from the latter. There will probably be built-in scrobbling to Last.fm. Whether it will be a full move to iTunes 9 remains to be seen. There could also be new content deals. And of course, the rumours persist (as they always do) about The Beatles coming to iTunes. Seriously, we're beyond caring, but with the reissues of the remastered albums and Beatles Rock Band about to emerge, what more obvious time? We will start caring if Paul McCartney and Ringo Starr take the stage. If the albums get on iTunes that isn't such a strange possibility – they appeared at the launch of Rock Band earlier this year. And, if you're still wondering when the tablet will make its debut – and so are we – all the signs are you'll be waiting until January.